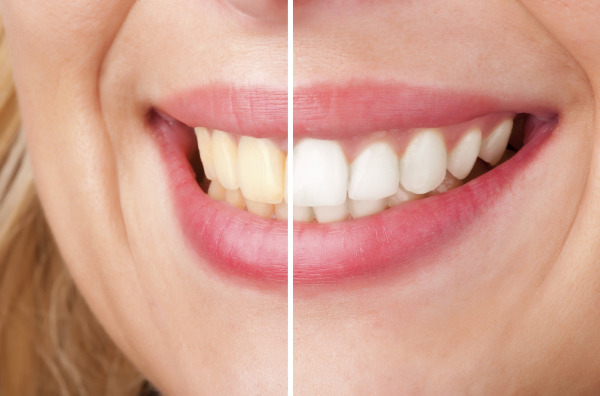 Teeth whitening is the process of removing tooth discoloration to reveal a brighter smile. A number of toothpastes and mouth rinses are available over the counter and claim to whiten teeth, but these products typically are not powerful enough to address staining in deeper levels of tooth enamel. Because over-the-counter products can also cause tooth sensitivity and irritation to the gum line, opting for professional whitening services is the more effective, safer way to handle staining. Edison Dental Arts in Edison, NJ, can help you have a whiter smile with the latest in professional teeth whitening technology. Staining of the teeth is most often caused by foods and drinks that are heavily pigmented, like red wine, coffee, and tea. Anything that could stain a white shirt, could contribute to stains on your teeth. Tobacco use is another common cause of aging, and many people experience discoloration related to age or even use of certain medication. What About At-Home Teeth Whitening? If you prefer to perform your whitening treatments at home, there are more effective options than the over-the-counter kits sold in stores. Along with our In-Office whitening system, Colgate Optic White® Professional Whitening offers a kit for at-home use. These kits are formulated to be as gentle as possible to the teeth and gums, while still giving you the fresh smile you’re hoping for. No procedure for teeth whitening is permanent. If you continue to smoke or eat and drink heavily pigmented foods, discoloration will gradually return. Ongoing issues with staining can easily be dealt with through the use of touch-up gel. Will Whitening Work for You? Contact us Today! To determine if teeth whitening treatment could be of benefit for your unique needs, Dr. Vitale and Dr. Tedeschi will examine the health of your teeth and gums and discuss the best options for treatment.